The election to be the next governor of Alaska is still 21 months away, but the dynamics that will determine who wins the race are being established now. With the state legislature in session, our budget crisis unresolved, and the state slipping into recession, many are focusing on the policies and economic factors that will undoubtedly play out in that election. But there is a larger, strictly political, and completely unresolved question that could all but decide the race far before any of those issues have a chance to come into play. That question: How many Republicans will run? Were you expecting a question like “Will the Governor run again?” or “Will the Democrats run their own candidate this time?” Or perhaps you think Governor Walker’s decision to veto PFD payouts has already decided the race. Those are all fair thoughts, and yes, all these factors will come into play in the race still to be run, but they won’t decide the race. The number of Republicans who jump in could. First of all, let’s deal with the question of if the current Governor will run — he will. Walker hasn’t yet achieved any of the big goals he set for himself coming into office. The gas line appears no closer to construction than when he took office. The state budget is still a disaster, with the legislature failing to adopt a broad-based way to pay for state government, failing to reform Alaska’s Permanent Fund to generate more revenue for state services, and not even close to finding enough spending cuts to make the budget sustainable. So Walker still has a lot of work to do. He hasn’t announced anything definitive, but Walker did recently tell the AP’s Becky Bohrer “he’ll probably seek re-election.” That admission, along with replacing his Chief of Staff Jim Whitaker with campaign veteran Scott Kendall and bringing campaign consultant John-Henry Heckendorn shows a Governor’s office tacking away from blind adherence to principle and toward the sensitivity to political and public perception needed to win an election. Mark it down: If the Governor or his staff can see any pathway to victory, he is in. Most politicos and party officials have been assuming Walker will try to repeat his 2014 victory by getting the Alaska Democratic Party to field no candidate, allowing Walker to run once again as the “Unity ticket” against only a Republican opponent. That may not be possible this time around. Rank-and-file Democratic voters in Alaska are tired of settling for “not-too-Republican” choices. They increasingly want a true progressive voice to represent them on the ballot. This was evident last fall when Democratic primary voters in the U.S. Senate election chose the combative and controversial Ray Metcalfe as their standard bearer over establishment-friendly choice Edgar Blatchford. I won’t go into Metcalfe’s long history here, but the fact that Democratic voters across the state voted for his “Bernie-crat” platform is telling. This winter’s national progressive revolt against President Donald Trump is further emboldening left-wing activists. They will demand a progressive, or at least a “real” Democrat, occupies their line on the ballot next fall. That substantially weakens party insiders’ ability to broker any sort of sequel to the deal that put Bill Walker in office two years ago, and any candidate seen as a Walker stand-in the Democratic primary will get blown out by any challenger running to the left. Then again, the Governor is registered as an Independent, so maybe he would run in a three-way general election contest against a Republican nominee and a Democrat nominee. That would be a steep hill to climb. Walker only beat Gov. Sean Parnell two years ago by a 48.1% to 45.9% margin — less than 9,000 votes. In that case there was no Democrat on the ballot and Parnell was suffering through a nasty scandal involving sexual misconduct in the Alaska National Guard. As I noted above, the former isn’t likely to happen again and the latter, a massive Republican campaign-sinking scandal, isn’t a stroke of luck Walker should expect again. A viable Republican opponent and any Democrat’s name on the ballot would cost Walker at least 10-15 points. So, being the non-Democrat Democrat won’t work this time and an Independent run is a long-shot. What’s left? Just about any Republican insider is going to drop a parade of profanity when they read this, but Walker’s best path to victory might just come from running in the Republican primary. Alaska Republican Party Vice-Chairman Rick Whitbeck has taken to the airwaves in recent weeks saying he has a list of 46 names of people considering running for Governor. The word I’m hearing is the list is now well over 50 and closing in on 60. Of course, very few of those names will actually jump into the Republican primary, but that list does show plenty of interest, and that GOP leaders are actively recruiting. Gillam isn’t alone. Sen. Mike Dunleavy from the Mat-Su is also making moves to set himself up for a statewide run. His introduction of SB 1 and SB 2, both moves intended to avoid reforming the Permanent Fund and also go back and pay out the money Governor Walker vetoed last year, is clearly an attempt by Dunleavy to stake out the “I’ll protect your PFD” high ground in a statewide race. Then there is newly retired Mat-Su Senator Charlie Huggins, a retired Army Colonel who sports solid conservative credentials. He continues to be rumored to be seriously exploring a gubernatorial run in 2018. Not holding elected office gives him the time to run, and offers him the freedom of not being forced to take any inconvenient positions on the thorny state budget issues the legislature will be dealing with in the next two years. So, let’s assume those three — Gillam, Dunleavy, and Huggins — get in the GOP primary. There are still plenty of others who could join them, including former Anchorage Mayor Dan Sullivan, Sen. Anna MacKinnon, conservative favorite Joe Miller, and even former Gov. Sean Parnell. Heck, Whitbeck says he has another 40-plus names on his list. I don’t see any one of these as likely to jump in, but Republicans see Walker as so vulnerable, and Whitbeck’s list shows there is so much interest and recruiting going on, that it’s impossible to believe at least one more candidate won’t jump in. Now, think about this: If Walker re-registers as a Republican — as he was for many years before Democrats made him register as an Independent as a condition of joining forces with him to form the “unity ticket” — that would make five. In a race with five serious candidates, the first one to crack 30-35% probably wins. Just look at the 2014 Republican U.S. Senate primary. Senator Dan Sullivan won with just 40.05% of the vote, and he faced just two other serious opponents, Joe Miller and Lt. Gov. Mead Treadwell. Now add two more to the mix and the magic number needed to win drops substantially. If that scenario presents itself, the Governor would be well positioned to take advantage and run as a Republican. As the sitting Governor, Walker will be able to raise plenty of campaign cash, and he now has statewide name recognition. His staff moves are also likely to help. New hires Scott Kendall and John-Henry Heckendorn each have plenty of experience running moderate candidates in Republican primaries and winning. Last fall, Kendall worked on Sen. Lisa Murkowski’s campaign and Heckendorn helped Republican primary winners Rep. Gary Knopp and Rep. Delena Johnson fend off more conservative GOP opponents. Walker is also no stranger to Alaska Republican primary voters. He ran in the Republican primary for Governor in 2010 and received 33% of the vote in a three-way race. Put all those factors together and there is good reason to think Walker should get at least 25-30% in a Republican primary. Is that enough to win? Maybe. After all, a moderate or pro-labor Republican like Fairbanks Sen. Click Bishop could jump in a steal valuable base of support from Walker. If that doesn’t happen though, going through a crowded GOP primary would be a better prospect than counting on the continuing generosity of Democrats offering not to run anyone, or winning a three-way general election bid. The challenge Republican leaders have to consider now is how do to recruit a robust field of Republican candidates for 2018, but not go so far they offer the guy you want to defeat a path to victory? 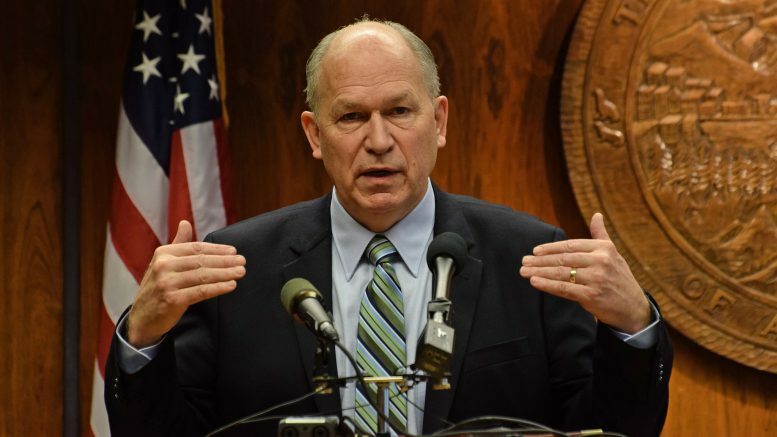 1 Comment on "Game Theory: The One Question That Could Decide Who Alaska’s Next Governor Will Be"
certainly will not vote for this thief again.